Work began in 1899 to the design of Maynall and Littlewood of Manchester. 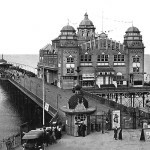 The pier opened on 1st June 1900 to a length of 220 feet, including a 2500 seat pavilion. The Bijou Theatre, built in 1916, accommodated 600. In 1922, the main pavilion was burnt down. It was replaced the following year, by the pier’s new owners, the local council. In 1933, the pavilion was once again destroyed by fire and, two months later, a separate blaze wrecked the Bijou Theatre. A replacement pavilion opened in 1934. Repairs were made to the pier in 1954 and from 1964 onwards. Trust House Forte became owners in 1968, and the structure was refurbished. However, in 1976 THF applied to demolish the seaward end. A 4000 signature petition helped persuade Colwyn Borough Council to refuse permission. Parker Leisure Holdings bought the pier in 1979 and converted the ‘Dixieland Showbar’ into a disco with adjoining bars. In 1986, it was estimated that repairs to the seaward end would cost £250,000 and, although grants were being sought, a further application for demolition was made in 1987. The pier was put up for sale in 1989 and again in July 1991. The pier was closed and seemed doomed. Ownership transferred to Mr. and Mrs. Paxman in late 1994 and restoration work commenced. Visitors were admitted during the summer of 1995. The Paxmans lived on the pier but were unable to transform it into a major tourist attraction, and in December 2003 the pier was sold to Mr. Steve Hunt. Mr Hunt began a programme of refurbishment of the pier but as a private owner, was ineligible for Heritage Lottery Fund or other grants. In 2008, in a highly charged dispute with Conwy Council, Steve Hunt was made bankrupt, something he fought vigorously to get overturned accusing the Council of corruption. 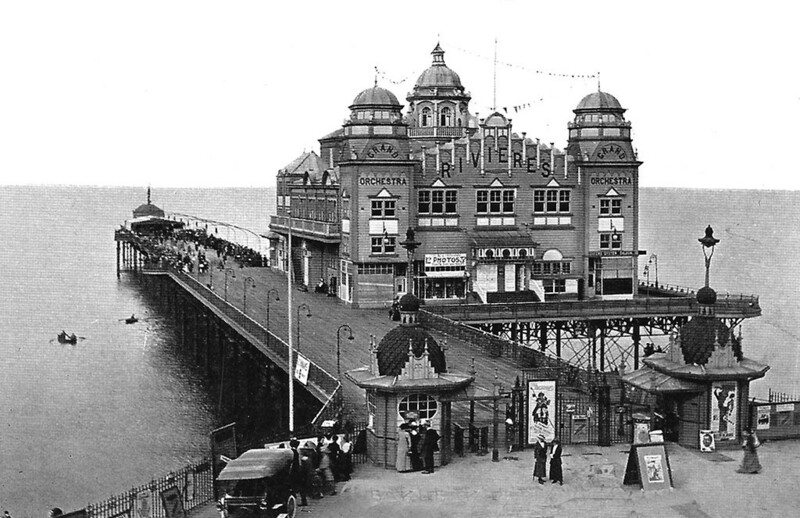 In the meantime, management of the pier was vested in trustees, Royce Peeling Green (RPG) but the pier continued to deteriorate and demolition was beginning to be considered. In 2010, a local support group, the Victoria Pier Pressure Group announced their plans to acquire the Victoria Pier from the trustees and outlined proposals for the pier which include a new cafe, bar, children’s entertainment, fishing facilities and a historic and environmental educational centre. However, with an estimate of £5.5 million pounds to restore the pier, this was clearly going to be a very challenging project. With Mr Hunt effectively sidelined, but still asserting his rights to the pier, plans began for a submission to the Heritage Lottery Fund. The Council were supportive of the Pier Pressure Group’s proposals and added support came from the Welsh Government Minister who visited the pier in February 2011. 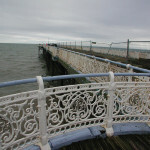 However, not everyone felt that restoring the pier was the best option and in March 2011, the Chairman of the Colwyn Bay Civic Society called for the pier to be demolished. Neverthless, in May 2011 Conwy Council announced that they would try to buy the pier and would be seeking Welsh Government assistance. Then in June 2011, Mr Hunt, the previous owner started a hunger strike in protest at what he claimed was “overwhelming evidence of wrongdoing” by the council. The local MP, David Jones, persuaded Mr Hunt to give up his hunger strike but said that he felt that Mr Hunt had been ‘airbrushed out of the process’ and that there had been ‘insufficent engagement’ with him. Also in June 2011, the new not-for-profit company, ‘Shore Thing’, who had already been working closely with the Pier Pressure Group, announced plans to run the pier on a not-for-profit basis, reinvesting profits back into the business. But the Trustees, RPG, who effectively still owned the pier were becoming increasingly concerned as the pier’s condition became worse with each passing day and pieces began falling off it. Finally, in August 2011, they took the decision to disclaim interest in the pier pursuant to section 315 of the Insolvency Act 1986 and ownership automatically passed to the Crown Estate. Mr Hunt, having now been discharged from bankruptcy, reasserted his claim to ownership of the pier and said he wanted to restore it. In November 2011, a public consultation was held and Shore Thing’s plans for the restored pier were put on show. These received strong support and in March 2012, a bid went before the HLF Board for £4.9million towards the estimated total cost of £10 million. However, the question of the pier’s ownership was still to be resolved. Then at the end of March 2012, it was announced that Conwy County Council had bought the Victoria Pier from the Crown Estate with a £36,000 grant from the Welsh Government. This was not without its risks given that the HLF bid had not yet been decided, something that became even clearer when only a few days later the HLF bid was rejected. Nevertheless, Jennifer Stewart, head of HLF Wales, said that they were “impressed with the council’s imaginative plans to transform Colwyn Bay Victoria pier and its art deco pavilion into a much-needed community and tourist centre”. The Council said a new improved Lottery bid would be made and that at least now the council finally had control over the Grade II listed structure. This statement seemed somewhat optimistic as a legal challenge to the ownership of Colwyn Bay’s Victoria pier was then made by its previous owner, Steve Hunt. The case was scheduled for a full day hearing. Work continued to make the pier safe and in August 2012 it was reported that a hearing at Cardiff Crown Court had ruled in the council’s favour. In November 2012, the courts also ruled against a separate claim of a ‘beneficial interest’ by Mr Hunt’s mother. But this was still not the end of the ownership dispute as in December 2012, an order was issued in the Royal Courts of Justice giving Mr Hunt permission to appeal against the earlier decision that it should not be handed back to him. Meanwhile, the council and Shore Thing continued with their bid for HLF funds to restore the pier which it was announced would include plans for an arts centre and there was strong support for the remains of murals dating from the 1930s, by the artists Eric Ravilious and Mary Adshead, and which had been covered in both wallpaper and a thin layer of plaster, to be restored. The HLF bid for £5 million was submitted in March 2013. April 2013 saw the continuation of the battle for ownership of the pier in an appeal at the High Court in London. The former owner, Steve Hunt, who had been made bankrupt in 2008 in a dispute over unpaid council tax and business rates, argued that the Victorian pier should have come to him three years after the bankruptcy. Mr Hunt’s mother also claimed that she still had an interest in the pier since she had paid over part of the money towards its purchase in 2003. Conwy council disputed both claims and judgement was reserved. However, in May 2013, Sir William Blackburne subsequently ruled that Mr Hunt should get another chance to persuade a local judge that the pier, and the foreshore on which it stands, should be formally ‘vested’ in him. There would therefore need to be a re-hearing of the dispute at the County Court. Despite the continuing saga of the pier’s ownership, later in the month the Heritage Lottery Fund approved a grant of nearly £594,900 to be used by Conwy Council to develop plans for the full restoration of the pier. The grant would include restoration of the pier’s Art Deco pavilion, and would also allow the council to apply for more HLF funding to assist a bid for the full award of £4,379,600 to complete the scheme. In July, the Victoria Pier Pressure Group and social enterprise Shore Thing announced a strategy involving awareness and fundraising events, including the Summer Grand Draw Raffle on Friday, July 26 at 5pm, drawn by Conwy Council chief executive Iwan Davies. More events were planned and the group aimed to establish a permanent presence in a portable cabin outside the pier to raise awareness. Then in September 2013, Colwyn Bay town councillors approved a £20,000 grant towards funding a professional design team to draw up final proposals for the restoration and development of the pier. An appeal was launched in October to raise £65,000 to preserve a rare mural created in the 1930s by Eric Ravilious and Mary Adshead which had been discovered covered in wallpaper and a thin layer of plaster in the crumbling pier building. In November, a report was presented to Conwy Council indicating that the restoration of the pier could cost £15,000,000. This immediately prompted discussions on whether the pier should simply be demolished instead of being restored. This would need the Grade II structure to be de-listed by heritage organisation, CADW. Throughout December, the news that demolition of the pier was being considered generated a very strong response from businessess, local groups and members of the public. It was reported that demolition would itself cost in the region of £1,000,000 which would effectively be dead money. Nevertheless, despite vehement opposition within the town, Conwy councillors went ahead and voted to demolish the pier. In January 2014, dozens of people were turned away from a packed meeting of the town council at which the director of pressure group, Shore Thing, reported that the business plan to save the pier had not even been seen by the full council. The ownership of the pier also had still not been decided and was awaiting a court case in August. 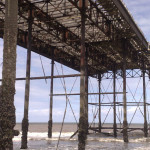 Later in the month, photos taken by Gavin Davies, director of Shore Thing, underlined the dereliction inside the pier, with bird droppings covering the interior of the main pavilion and rooms full of damaged junk and caved in ceilings. Nevertheless, Mr Davies remained confident that the pier could be saved. In February 2014, Conwy Council formally declined the HLF award of £594,900 which had been intended to develop the restoration plans. But Shore Thing announced that they were putting together a fresh bid to HLF to save the pier. A final plea to reverse the demolition of the pier was made in March 2014 by the Victorian Society who said that the £15,000,000 figure previously quoted was based on not just a restoration, but a major redevelopment of the structure and how it could function and there were much less costly options available. However, the likelihood remained that the council would still vote for demolition. But in the same month, it was reported that Conwy Council’s Cabinet members were being asked to vote for demolition of the pier, after a full council decision to have the pier de-listed on the grounds that redevelopment was not a viable option. In April 2014, it was reported that the court hearing between businessman Steve Hunt and Conwy Council which was due to take place next week had now been postponed until after June 6 due to problems with receipt of court papers. And in June 2014, an application by Mr Hunt in May to have Conwy Council removed from the on-going proceedings and, failing that, to have the council’s evidence struck out, was refused by a judge in Cardiff County Court, but Mr Hunt lodged an appeal to the High Court in England which meant that the hearing would now be delayed until August. Also in June 2014, Gavin Davies from the Victoria Pier Trust claimed Conwy council was ignoring its requests for meetings and dialogue with the authority. 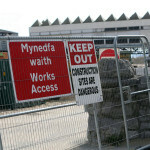 Iwan Davies, Conwy County Council’s Chief Executive, said that they had not received any approach from the Victoria Pier Trust, a claim Mr Davies said was absolute rubbish. In August, the much awaited court case between the council and Mr Hunt was again adjourned until the autumn. However, the council decide to continue with their strategy to have the pier removed, notwithstanding the outcome of the litigation. So in September, Conwy council appointed independent environmental consultants Nash Partnership of Bath to advise and support its demolition bid. The consultant’s would test the merits of Conwy’s case for demolition, report monthly and conclude its work by November or December. Although the consultant was reported as already expressing doubt over the pier’s future. With the pier continuing its fall into disrepair, in October Conwy Council applied for a marine licence to Natural Resources Wales to erect a fence “to protect the public from (the) risk of the unstable structure”. But also in October, in direct opposition to the strategy of Conwy County Council, Colwyn Bay Town Councillors voted to submit a bid — likely to be about £8.5m — by the end of November to the Heritage Lottery Fund to redevelop the Grade II listed Victoria Pier and signed a “memorandum of understanding” to enter a partnership with the Colwyn Victoria Pier Trust in regards to the application. November saw campaigners finalising a multi-million pound bid to the Heritage Lottery Fund to rescue the Victoria pier, a move backed by Colwyn Bay Town Council, which signed a “memorandum of understanding” to enter a partnership with the Colwyn Victoria Pier Trust in regards to the application. A decision on the application was thought could be made as early as April 2015. In December the court proceedings on ownership of the pier were once again delayed “due to separate proceedings being brought by Mr Hunt in respect of a bankruptcy issue against another party”. In January 2015, Conwy Council claimed the the pier was at ‘imminent risk of self-demolition’ and said the beach around pier had to be fenced off because of the risk of collapse. It was reported in February 2015 that Conwy Council’s legal costs in their dipute over the ownership of the pier would be likely to exceed £250,000, reportedly more than a third of the total upkeep figure. A further court hearing was due later in the year. Also in February 2015, Conwy council submitted a planning application to demolish the pier, despite the there not having been a decision made by HLF on a multi-million pound grant to redevelop it. 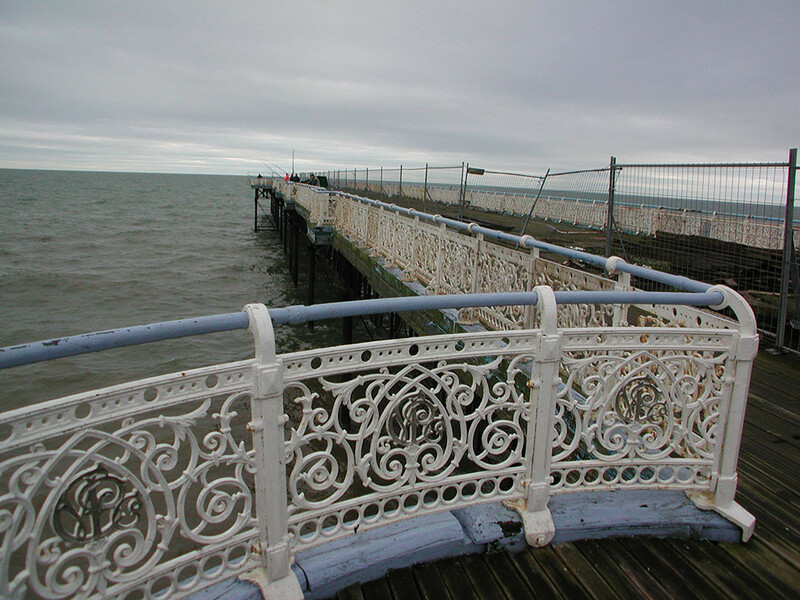 In March, representatives of the Heritage Lottery Fund travelled to Colwyn Bay to view the Victoria Pier for themselves, and to hear a heartfelt plea from Colwyn Victoria Pier Trust for a £9.6m grant to redevelop it. In April 2015, a decision on the £9.6million Heritage Lottery Fund application was expected to be made on 28th April, but the outcome would not be revealed until May 8 due to the upcoming General Election. The bid to redevelop the Victoria Pier was rejected by the HLF in May 2015, one of the reasons being the lack of “strong support” from Conwy Council. The HLF said that they had not received a clear enough indication of strong support from Conwy County Borough Council and in light of this, as well as the absence of other confirmed financial support and the potential for increased costs, the application was deemed high risk. Despite the setback of the £9.6million proposal to restore the Colwyn Bay pier being refused by Heritage Lottery Fund, members of the Colwyn Victoria Pier Trust began working on submitting a second bid in November. The saga continued in June 2015 when Conwy council’s planning committee said it was minded to grant conditional permission for demolition of the pier. However, the proposals still needed listed building consent. Also in June, it was reported that a special council meeting had been arranged in which Conwy councillors would meet with members of the Colwyn Victoria Pier Trust, looking to redevelop the Grade II listed structure. The Pier Trust described the meeting as good news and an opportunity to make councillors aware of the full facts of the case. The dispute over ownership of the pier, which had been contested for several years, reached the High Court in London in October 2015. Former owner, Steve Hunt, claimed the pier ownership should have reverted to him three years after he was made bankrupt but Conwy council argued that it passed to the Crown Estate before it signed a deal to buy the pier in 2012. In February 2016, local MP, David Jones, strongly criticised Conwy council in its handling of the debacle over the pier. He said that the £250,000 in fees spent by the council could have been better spent on local services and questioned why the council bought Victoria Pier in the first place, when it now proposed to demolish it at an estimated further cost of £1m. In March 2016, Mark Roberts, the new chairman of the Colwyn Bay Victoria Pier Trust unveiled a new proposal to save the town’s Victoria Pier which involved the dismantling of the pier, as opposed to its demolition, in order to examine all of its components and their viability.Mr Roberts said the trust was already exploring funding channels to continue its work, and that discussions had been opened with Conwy Council to seek permission for dismantling the structure. An inspection of Colwyn Bay’s Victoria Pier was launched by Conwy BC in May 2016 to support its plans to demolish the pier. The pier, a Grade II listed building required government consent for any proposal to demolish and the council expressed the hope that the new survey would enable them to gain this consent. 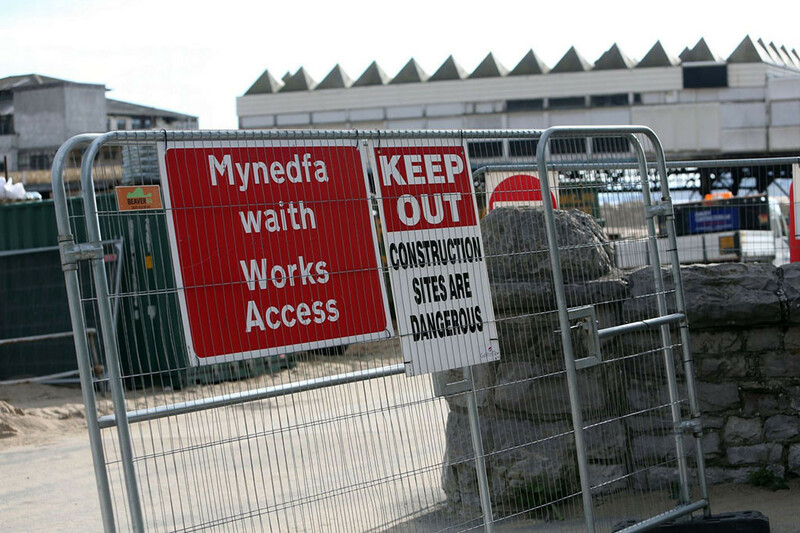 Work on the latest phase of Conwy CBC’s multi-million pound plans to regenerate the waterfront caused a 1km stretch of the promenade road to be closed and diversions put in place in August 2016. The development included widening, realigning and raising a section of the existing promenade, improving parking and new landscaping. August 2016 – What is going on with Colwyn Bay Pier? However, Mark Roberts, chairman of the Colwyn Bay Victoria Pier Trust who are fighting hard to retain the pier, said: “No. Demolition is not an option, not until every avenue has been explored.” Mr Roberts said he was speaking not from a Trust perspective but as a former chief planning officer who is qualified in planning law. Also in December 2016, engineers carried out the final part of the structural assessment on the pier, which Conwy County Borough Council were proposing to use to support the case for demolition in its forthcoming planning application. Later in the month, footage taken by a drone camera showed the result of the years of neglect and poor maintenance on the decaying pier. In January 2017, as Conwy CBC prepared to submit its second application for listed building consent to demolish the pier, the Victoria Pier Trust chairman, Mark Roberts, said the Trust would be unveiling their vision for the future of the pier at the end of the month. January also saw a more positive report in which Conwy Council council said it had a positive meeting with the pier trust and would now be dismantling and storing the structure with the possibility of a future rebuild. The following month a large section of the pier at the seward end collapsed into the sea. Engineers began assessing the damage to the partially collapsed pier which had been fenced off for some time because of its deteriorating condition. Notwithstanding the collapse of the seaward section of the pier, February also saw Conwy Council confirm its plans to submit a Listed Building Consent application to dismantle the pier and then store the dismantled listed components for the Victoria Pier Trust to restore the pier in the future. 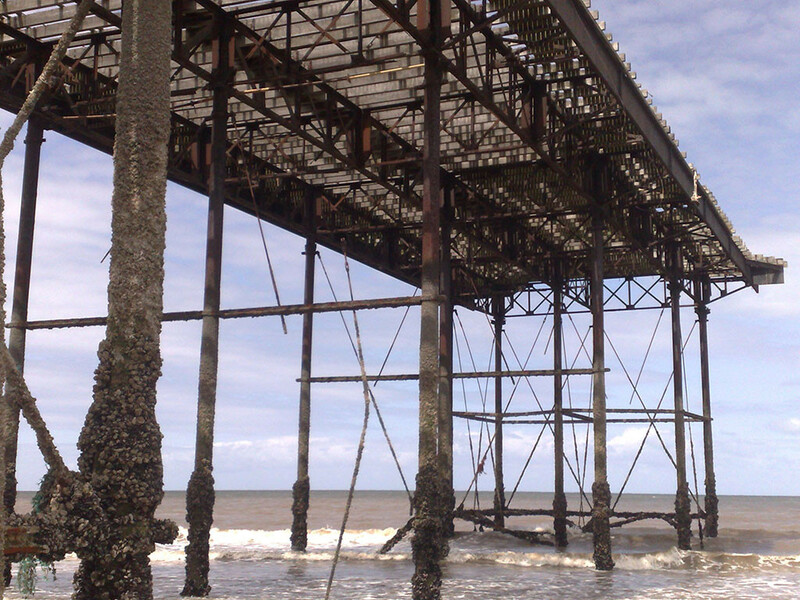 The Council’s cabinet considered an urgent report later in the month which said that because of the risk of further collapse, the council could not wait for the listed building consent to be granted before removing the collapsed section of the pier. The council therefore voted to dismantle and remove this section. Work was expected to take about three weeks. At the end of February, high winds and waves generated by storm Doris, one of the worst to hit North Wales in recent years, caused a further collapse of the seaward section of the pier. Welsh heritage body, CADW, and the Health and Safety Executive were monitoring the situation as the initial work to disconnect the collapsed section of the Victoria pier and the removal of materials commenced. The remainder of the seaward section would then be dismantled. During March 2017, agreement was reached that the derelict Victoria Pier be redeveloped into a shortened boardwalk. Conwy council, which had originally been pressing for the demolition of the pier, also agreed to support the Colwyn Victoria Pier Trust (CVPT) bid to restore the pier, recreate the 1930s Art Deco pavilion, develop a new learning centre and install kiosks. The Heritage Lottery Fund had made it clear that the support of the council for the trust’s project would be an essential pre-requisite for any application for funding. March 2017 – Exciting plans for the regeneration of Colwyn Bay Pier revealed! Later in the month, the first images of a design concept for a restored Victoria Pier, including an open air cinema, an outdoor stage and a heritage centre, were unveiled at a public meeting by members of the Colwyn Bay Victoria Pier Trust. In May 2017, it was reported that an HLF representative had advised Colwyn Bay Victoria Pier Trust(CVPT) and Conwy CBC that funding from HLF was unlikely to be considered because piers were seen as high risk projects. CVPT were particularly aggrieved because they had been previously led to believe by HLF that the project to restore the pier would be considered for funding. HLF later appeared to back track from their statements about non-funding of piers. In July 2017, Conwy Council’s planning committee granted permission for the Victoria Pier to be dismantled and a shortened boardwalk be rebuilt closest to the landward end. Retrospective permission was also given for a section which had already been dismantled on safety grounds. In August 2017, it emerged that a dialogue was continuing between Colwyn Bay Victoria Pier Trust(CVPT) and the Heritage Lottery Fund(HLF) on the future of the Victoria Pier. The result of Conwy Council’s application for Listed Building Consent to dismantle the pier as part of the initial stages of the restoration project was expected in September. Asbestos sheeting was used in the construction of the main pavilion in the 1930s. A report by Conwy council said the sheeting could break up if the pier was hit by bad weather and wanted to dismantle it as soon as possible. In October 2017, the Welsh Government gave approval for the full dismantling of the Victoria Pier, enabling Conwy council to move ahead with proposed redevelopment plans. Councillors reiterated their continued support of Colwyn Victoria Pier Trust, as the Trust continued to develop proposals and funding applications for the future restoration and re-creation of a more substantial, self-sufficient pier. In mid-January 2018, it was announced that contractors would begin the dismantling of the old pier within weeks. The work was estimated to take four months. Parts of the pier having been removed carefully were being put into storage to be surveyed to be used in the reconstruction of the pier later this year. The following month, further details emerged on the work has being done to save as much of the murals from the pavilion of Colwyn Bay’s pier as it is demolished. Work by war artist Eric Ravilious and murals by painter Mary Adshead formed part of the decoration inside the art deco pavilion when it was constructed in 1934. Experts initially said the murals would be impossible to remove but staff were working to retain them. In April 2018, the North Wales Pioneer reported that the Victoria Pier Trust had held its AGM on Wednesday, March 28 where discussions were held around the development of the ongoing scheme for the Colwyn Bay Pier, progress with the dismantling and the working relationship with the Conwy County Borough Council. Contractors pulling down Colwyn Bay’s Victoria Pier during April divided the structure to guard against fire breaking out during the dismantling work. The project was reported as making good headway. In May 2018, it was reported that dismantling of the Colwyn Bay Pier should be completed by mid-June. The Colwyn Victoria Pier Trust had been working closely with the Conwy County Borough Council and were currently working to put together their own scheme, which Trust chairperson, Mark Roberts, said was in its initial phase and that he was hoping to put it to public consultation as soon as possible. Designs for truncated pier at Colwyn Bay get underway! Pier we go again at Colwyn Bay! Colwyn Bay Pier gone – but not for long!